“EDP Wasp in very good condition for its age and in perfect working order. Just spent £250 having it repaired and serviced ( sorry – warranty not transferable ). 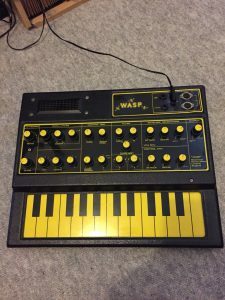 “EDP Wasp – this is an original UK made Wasp synth with power supply. As you can see it is in excellent condition with all its original parts. The internal speaker works and the synth had been serviced prior to me buying it. The Wasp features a touch sensitive keyboard which can often develop problems however this one works perfectly. All features work as they ought to and the synth is great for creating quirky noises, aggressive leads and big bass drones. There are lots of articles online. The casing of this one is in remarkable condition – I’ve owned four Wasps over the years and all have been cracked or broken, one had had a wooden case built around it the plastic was so damaged! The Wasp came to me from a music department and has the school name etched onto it. 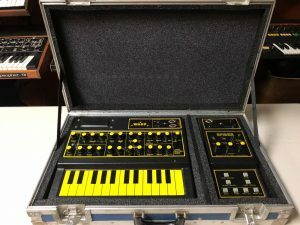 The only issue with the synth is that the volume pot – which doubles as an on/off switch – has been replaced and it stays permanently on although the volume is adjusted as normal. The unit is clean inside with no evidence of battery leakage. I’ve not tried using it with batteries however they would soon drain given the on/off switch issue. If you want to hear what the Wasp synth is capable of there is an album called The Bridge by Thomas Lear and Robert Rental that was recorded in the 80s using a Wem copicat, guitar and two Wasp synths. There are numerous other demos online. “I’m sure you know how rare and sought after these are, i was given this as payment for recording time when i still ran a studio, the owner had soldered in a power cable because he couldn’t find the connector in Tandy (They are about 50p on ebay haha) it hasn’t done any damage but i have left it as is so the new owner can take it out when they wish, the battery panel on the bottom is missing, there is one cut out of Aluminium that i will send with it, some of the yellow caps are missing and the upper and lower parts of the plastic case are not screwed together, has been sat in a cupboard since it was last turned on, moving so needs to go. “This is a super rare find and it is in very good condition. We had this checked out at Encore Music in Auburn California and when we opened the case he was silent (and he is an older musician). There are some issues with the cord (at the end) but it does work. Simple/easy/cheap fix if you wanted to replace it. There is also a small separation on the plastic edge. Drop of glue would fix that. 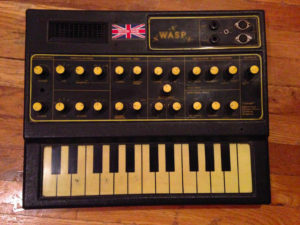 “A rare Electronic Dream Plant Wasp Synthesizer, serial # 001133, in working condition. Purchased from a US EBay seller in March 2016. The keyboard is working fine, the battery compartment is clean, the battery compartment lid is still there, the plastic case has no cracks or missing parts, all the screws are there, the speaker is working, and it powers up with batteries (not included) and 9v psu adaptor (included, European plug installed on the adaptor). 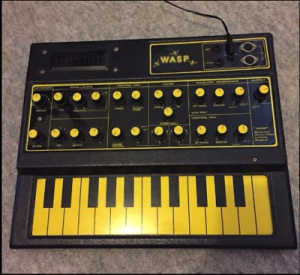 “Original vintage EDP wasp synthesiser has been in storage & recently found to be not working. Plastic case at bottom of keyboard has broken off. Link sockets & screws showing rust. 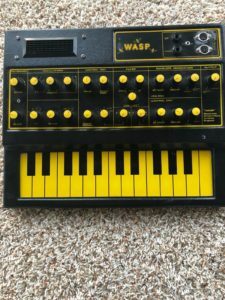 “A vintage EDP Wasp synth in need of a service/repair. We have fitted batteries to this and had a poke around with a multimeter and there is power appearing across the circuit board, but there is no output from the speaker, line, or headphone outputs. Physically, it is quite good. We are aware that the cheap plastic casing of these are prone to chips and damage, but the case on this is good with no chips to corners (there are some scratches). The very fragile internal battery tray DOES have a crack, but this is not visible when the item is assembled as it is internal (the battery tray is made of even thinner plastic than the rest of the item!). It is probably easier to attend to electronic components than to try to source a good case and keyboard for one of these. Careful examination suggests that some components have been replaced (for example one of the pot shafts is of a different color, and some of the knobs appear to be replacements). “Fully functional and very clean condition. The casing is damaged at the 2 rear corners and prof. repaired crack at the front upper side. Typical of this synth with the plastic casing…, but it’s still in good solid condition for it’s age. Internal speakers, all keys, knobs (refurbished) are working fine. Typical of this synth with the plastic casing, but it’s still in solid condition for it’s age. NB: This video is not of the actual item listed, but used for demonstration purposes of its capability. Plenty more on youtube. Legendary EDP Wasp by Chris Huggett, quirky looking toylike synth but a serious piece of kit, capable of rip roaring synth lines, fat bass…just straight up dirty with so much character. Great for all types of Electronic music. This was recently serviced by SRS in Jan 2017 and is studio ready. The casing is damaged in two corners typical of this synth with the plastic casing, originally designed that way to keep costs down. In any case this does not affect its functionality. Kept in a professional smoke free studio and tested prior to listing. “Unfortunately the WASP got insured after further hard life and after storage it for bout 3 years. Just the upper keyboard octave seems to produce some sounds some how right now. Optical there’s a crack in the case at the lower left side, just taped at the moment. Lower right side case is missing small part. 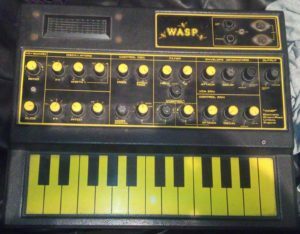 “Vintage EDP wasp synthesizer. Fully functional with MIDI and power supply and original manual. 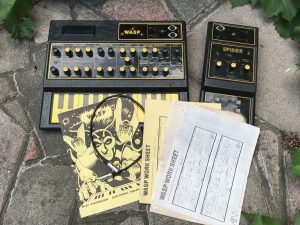 “Legendary EDP Wasp by Chris Huggett, quirky looking toylike synth but a serious piece of kit, capable of rip roaring synth lines, fat bass…just straight up dirty with so much character. Great for all types of Electronic music, I’m sad to see it go but needs a must. Overall condition is excellent, with minimal signs of wear and tear. Unlike most Wasps this one doesn’t have the cracked corners on the casing, however there is a slight scratch on the keybed which can be seen but not obvious, this does not affect its use. (please see pictures). “Absolut selten zu findender Vintage Synthesizer aus dem Hause Electronic Dream Planet. Nicht nur wegen seines einzigartigen Designs sorgte der WASP schon zum Erscheinungsjahr 1978 für Aufsehen. Mit seinem speziellen Klang, einer 2 Oktaven umfassende Folientastatur, einem integrierte Lautsprecher und der Möglichkeit mit Batterie betrieben zu werden, unterschied sich der Synthesizer optisch und klanglich von seiner Konkurrenz. Besonderes lebendig werden seine Sounds durch den 6 Wellenformen umfassenden LFO und seinen Multimode-Filter, der sowohl als Low Pass, als Band Pass oder als High Pass genutzt werden kann und bei höheren Resonanzen seinen eigenen, herrlich unsauberen Charakter entfaltet. 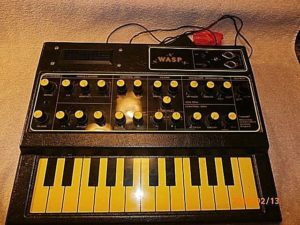 Here is an Incredible opportunity to purchase two wasp synthesizers. These have both been extensively used in the 1970’s and 80’s by a local leeds band “Lynx”. They are no longer in working order but can be restored to their former glory. The keyboards are particularly well worn and indeed one of them has a broken key. The Second picture and subsequent 4 pictures are of the better of the two synths. The casing is in good order and it still carries its original serial no sticker. The jack points are good and show little signs of rust and all button covers are intact. The seventh and following pictures are of the poorer of the two synths. It has no battery station protective back. A couple of the dial covers are missing and the jack points are rusty. Also there is a pice of the casing missing as in the illustration. 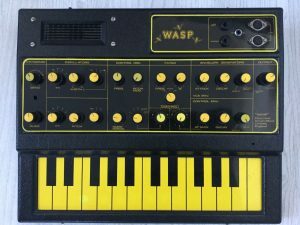 einen alten Synthesizer der Marke WASP, hergestellt 1978 von der Fa. EDP (Electronic Dream Plant) in Großbritannien. Es war der erste, kostengünstige Synthesizer. Die Experten werden ihn kennen. Allen anderen empfehle ich eine Recherche bei Wikipedia. Dieses Exemplar wurde nur kurzfristig genutzt, da die Band, die ihn angeschafft hatte, sich kurz danach auflöste. Die letzten 35 Jahre hat dieses Gerät gut verpackt auf einem trockenen Dachboden verbracht und wurde erst vor kurzem “wiederentdeckt”. This is for my wasp mono synth. Amazing fun synth and can be seriously dark too. This one is fully working and has no issues, although the case shows general marks and cracks – please check out the hi-res photos. This is only a minor problem, but I think it best to mention it. The keyboard play brilliantly. 240 v adaptor included. Cosmetic condition is good; there are no cracks or splits in the casing. One knob is missing (on the pitch pot as shown) but this I reckon could be picked up cheaply for someone in the know, and it doesn’t affect the operation. Powering up the unit, all the controls function (although my knowledge is limited of analogue synths, they all control the sound as I’d imagine. The control pot fourth from bottom right feels a little wonky so it might want to be replaced. The two link sockets on the top right are untested as I don’t know exactly what they do. “I am offering a EDP Wasp synthesiser with new power supply (not shown in photograph). I have owned this for the last 34 years and it has been mostly stored away in a cupboard. I offered this for sale about 3 years ago, and found out that one of the oscillators was not working. Since then I have had it fully repaired by ‘Vintage Synths’. The Wasp is now in full working order, with no cracks in the casing, and is in very good condition. The only minor blemish which you can see from the photographs, is the hand painted symbol at the top near the internal speaker.